In my family we have a time-honored tradition: there has to be cake. However, when you make cake a part of your daily life, this ups the ante when there’s actually something to celebrate. No regular old cake will do. There must be layers. Frosting is mandatory, as is tasteful decoration. Of course, it has to be delectable, and while we sometimes rely on old favorites – hello, Baked Diner Double Dark, I’m looking at you – surprises are encouraged. It’s enough to give even the most experienced and passionate baker performance anxiety. Especially a stressed-out baker with a looming work-related deadline. This was certainly true a few weeks ago, when I was trying to decide what to bake for my sister’s birthday. I went through all the usual sources of inspiration: looked through all my baking books including the ones collecting dust at the back of my kitchen cupboard, checked out a long list of favorite baking blogs, leafed through food magazines at the local supermarket, all to no avail. Thankfully, procrastination sometimes actually does lead to inspiration. Browsing Amazon for new baking books to pre-order this fall, I stumbled across Baked Occasions and immediately knew it would come to the rescue. Of course I couldn’t yet order the book, but among the “Look inside” preview pages on Amazon I found the recipe for Baked’s Ultimate Birthday Cake. 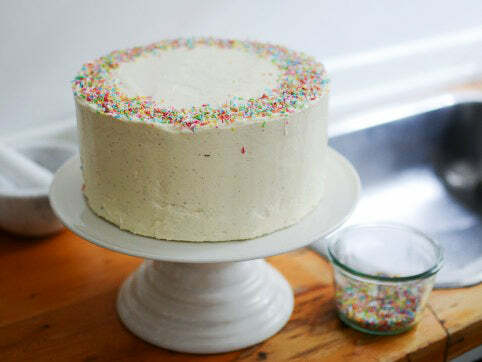 It promised a light vanilla sponge packed with colorful sprinkles, a smooth, rich vanilla frosting – all of it covered in a festive layer of sprinkles. That would do, even for my highly discerning (in all matters cake) sister. And the resulting cake delivered on all it’s promises. 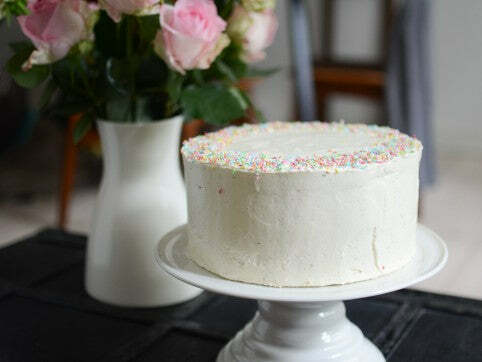 The cake layers are soft and moist, with a noticeable crunch from a full cup of sprinkles. The frosting, well, I don’t even know where to start. After a few failed attempts at the preferred frosting method from Baked’s books, I had all but given up on them, usually replacing them with a failsafe Swiss meringue buttercream. But I thought I would give this one a try and am I ever glad I did! 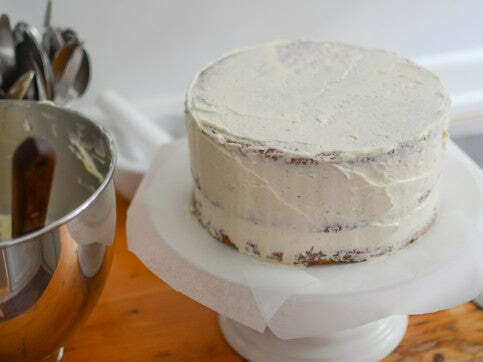 Velvety and rich, this frosting has an almost pudding-like texture with a lovely vanilla flavor. It was all I could do not to eat it straight from the bowl. Baking from a preview window on Amazon has left my iPad smudged in batter with buttery fingerprints across the back and cake crumbs permanently wedged into the home button. Do yourself and your gadgets a favor and buy the book instead. I know I will. From Baked Occasions: Desserts fro Leisure Activities, Holidays, and Informal Celebrations. 1. Preheat the oven to 325 F (165 C). 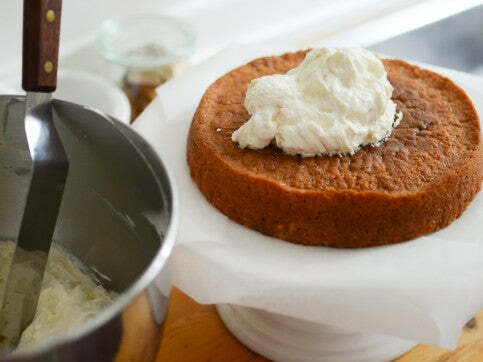 Butter three 8-inch (20-cm) round cake pans, line the bottoms with parchment paper, and butter the parchment. Dust with flour and knock out the excess flour. 2. Sift both flours, the baking powder, baking soda and salt together into a large bowl. Set aside. 3. in the bowl of a standing mixer fitted with the paddle attachment, beat the butter on medium speed until creamy, 3 to 4 minutes. Add the sugar and vanilla and beat on medium speed until fluffy, about 3 minutes. Scrape down the bowl, add the egg and beat until just combined. 4. In a small bowl, whisk together ice-cold water, milk and buttermilk. 5. Add the flour mixture to the mixer bowl in three separate additions, alternating with the water mixture, beginning and ending with the flour mixture; turn the mixer to low when you add the ingredients and turn to medium for a few seconds to incorporate. Scrape down the bowl, then mix on low speed for a few more seconds. Remove the bowl from the standing mixer, scatter the sprinkles across the top of the batter, and fold them in with a rubber spatula. 6. In a medium bowl, whisk the egg whites and cream of tartar just until soft peaks form; do not overbeat. Gently fold the egg whites into the batter with a rubber spatula. 7. Divide the batter among the prepared pans and smooth the tops. Bake for 40 to 45 minutes, rotating the pans halfway through the baking time, until a toothpick inserted in the center of each cake comes out clean. Transfer the cakes to a wire rack and let cool for 20 minutes. Invert the cakes onto the rack, remove from the pans, and let cool completely. Remove the parchment. 1. In a medium heavy-bottomed saucepan, whisk the sugar and flour together. Add the milk and cream and cook over medium heat, whisking occasionally, until the mixture comes to a boil and has thickened to the consistency of a light pudding, 10 to 15 minutes. 2. Transfer the mixture to the bowl of a standing mixture fitted with the paddle attachment. Beat on high speed until cool, at least 7 to 9 minutes. Reduce the speed to low and add the butter a few chunks at a time, every 20 to 30 seconds, while the mixer is constantly stirring; mix until thoroughly incorporated. Increase the speed to medium-high and beat until the frosting is light and fluffy, 1 to 2 minutes. Add the vanilla and mix until combined. If the frosting is too soft, place the bowl in the refrigerator to chill slightly, then beat again until it can hold its shape. If the frosting is too firm, set the bowl over a pot of simmering water and beat with a wooden spoon until it is spreadable. 1. 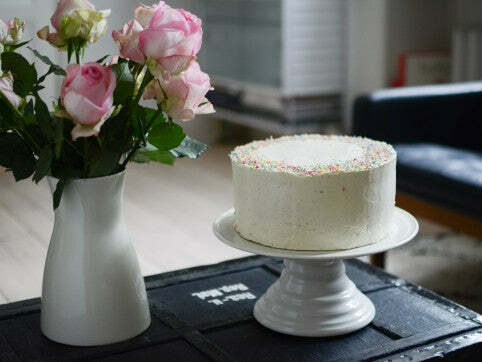 Place one cooled cake layer on a cake turntable or a serving platter. Evenly spread about 1 1/4 cups (215 g) of the frosting on top. Add the next layer, frost it as before, then add the third layer, inverted, for a completely flat top. Spread a very thin layer of frosting over the sides and top of the cake and place it in the refrigerator for about 15 minutes to firm up. 2. Place the cooled cake on the turntable. Frost the sides and top with the remaining frosting and decorate with remaining sprinkles. 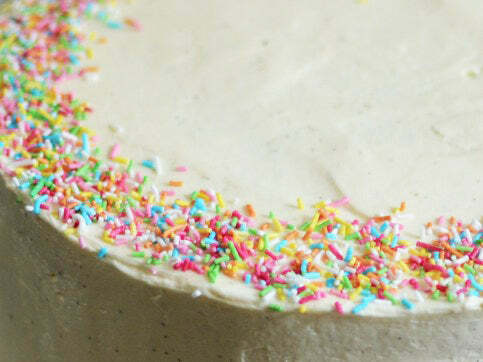 (To completely cover the cake in sprinkles, you will need approx. 1 to 1 1/4 cups or 190 to 240 g of rainbow sprinkles.) Chill the cake for about 5 minutes to set before serving.